In September, Amazon announced plans to open a second location in the United States, on a scale to its Seattle HQ, inviting cities to bid for the project in an open auction. 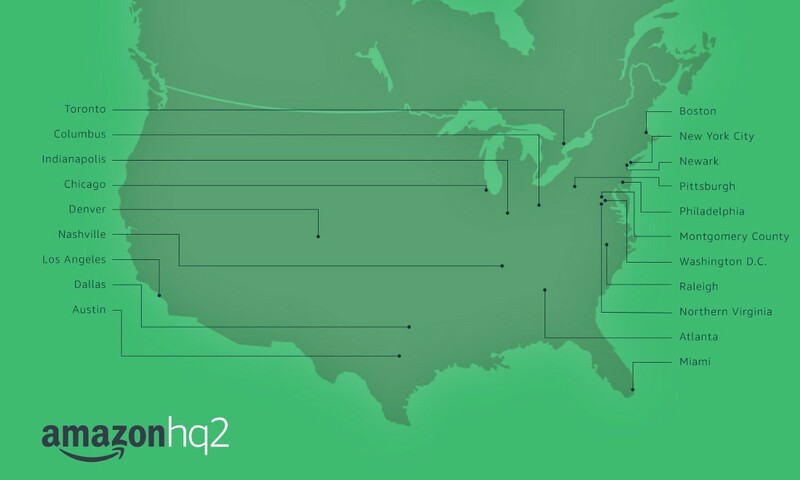 Automatically, cities across the country launched their candidatures: Amazon’s Seattle offices consist of 33 buildings spread across more than 750,000 square meters and employing some 40,000 people directly, with a further 13,000 indirect jobs, the vast majority of them highly qualified, contributing much more to the city than their combined $25.7 billion dollars in salaries: the company spends $43 million in payments to the municipal transportation system of Seattle in the form of an employee bonus. In 2016, it is estimated that visitors to the company and its employees accounted for a total of 233,000 hotel nights. The impact of the arrival a second Amazon headquarters could transform even large cities. Some 238 cities submitted candidacies for the $5 billion project, from which the company has drawn up a shortlist of 20. The winning candidate will have to tick a lot of boxes, ranging from the right location to a strong university system capable of supplying talent, along with state and local government-funded tax breaks. The company believes that the United States needs Amazon more than Amazon needs the United States. It has become one of the biggest generators of employment at all levels: its recruitment events attract thousands of people. This is a company that intends to dominate the world, and that in the United States it has become pretty much the default way to shop. Maryland has offered $5 billion in tax credits and transportation costs, New Jersey has gone all the way up to $7 billion, and Columbus (Ohio) has said it will eliminate all taxes on Amazon properties for 15 years, while refunding the company for part of the taxes its employees pay, and all this to lure the richest man in the world, owner of one of the most valuable companies in the world. What happens when Amazon finally decides on a city? What will be the impact on the local economy? Business will face the ultimate stress test, either by bending to meet the company’s fulfillment system (and accepting its conditions), or by trying to out-compete it. That said, Amazon encourages its workers to spend money locally in restaurants and bars and has a reputation for community construction. In the 20 years Amazon has been in Seattle the local economy has fared as well as any other US city. Amazon setting up in your city is obviously going to provide a boost to some aspects of the economy, but are the incentives being offered to attract it a good use of tax payers’ money? How do local companies feel when they see their city offering millions of dollars to woo a giant that might put them out of business? Where does this money come from? Which other budgets are being reduced to account for that? Infrastructures? Education? Which other priorities could see their budget reduced to account for the incentives demanded by Amazon? At the same time, businesses around the United States have been feeling the pressure for many years now. Amazon moving into your city means a big shake up to distribution: two-hour deliveries, more Amazon Prime (more people getting more out of their subscription by buying more stuff through Amazon) and big discounts on many products. Amazon’s arrival in your city will undoubtedly bring big change, and will be backed by local and state politicians, along with most residents, who will be looking at the impact on the job market and economic growth generally. At the same time, as has happened in Seattle, it will speed up gentrification, sending property prices rents up, as happens when large numbers of well-paid workers move in. Selling the idea to local businesses, however, may prove harder. But the business landscape is changing fast everywhere, in large part thanks to Amazon, and at least if it moves into your city, it will create some new opportunities your company may be able to take advantage of. Whatever Amazon decides, this latest dot.com gold rush highlights the importance of some companies have become and the influence they exercise on our environment.